GEORGE TOWN: Eager buyers snapped up about 40% of IJM Land Bhd’s newly launched Summer Place condominium units on the island over the weekend. The sales translated to about RM70mil of the RM174mil project off the Jelutong Expressway, managing director Datuk Soam Heng Choon told StarBiz. The 22-storey Summer Place comprises 531 units with built-up areas measuring between 1,012 and 1,464 sq ft, priced from RM273,000 to RM460,000. Soam said the project was about 40% completed. Construction work started in the third quarter last year and is scheduled for completion in 2011. “We are providing free legal fees on the sale and purchase agreement, free legal fees on loan and zero interest till completion of construction. “The selling point is that it is near the harbour, the Penang Bridge, located along the new promenade off Jelutong Expressway, and is close to town. 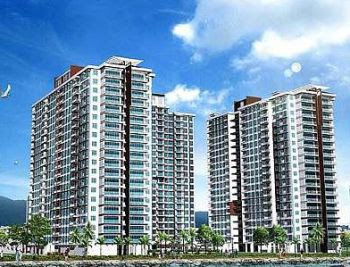 “Furthermore, the pricing from RM273,000 is very affordable,” Soam said. SHAH ALAM: Property developer I-Bhd has the chance to grasp opportunities in view of its large cash reserves, said chairman Tan Sri Hamad Kama Piah Che Othman. “At a time when many companies are facing a credit squeeze, the group remains financially strong with RM120mil cash and no borrowings,” added Hamad, who is also CEO of Permodalan Nasional Bhd (PNB). Although I-Bhd was still small, he noted that it made a record pre-tax profit of RM16mil last year. He observed that I-Bhd launched i-City three years ago as it re-invented itself from a digital lifestyle products manufacturer into a developer that provides a digital work environment. “And today, the building blocks are all coming into place,” he told reporters after the company AGM at i-City here yesterday. In another dimension of development, it is also planned for an International Islamic Financial Hub be set up in i-City. “In line with this, our first phase of development, which is the Cybercentre 1 Office Suite, is syariah-compliant,” Hamad said. The establishment of Islamic financial services is part of the national agenda in which i-City has a role to play. “There are many Malaysian companies, including those within the PNB group, which are looking at this sector and I believe there are many opportunities for I-Bhd to work with them to accelerate the i-City development,” Hamad said. On the impact of the global recession, newly-appointed CEO Lim Boon Siong said I-Bhd was reviewing and adjusting the phases to be launched in view of that. Even so, the company is sticking to its target to complete i-City, a project with a gross development value of RM2bil by 2015. Lim, who was appointed CEO last month, said the first phase of i-City was completed just three to four months ago. Following completion of development, tenants are being sought for the offices. “There are a lot of enquiries. Logica of Britain, for example, is already here,” he said. AmBank Bhd has also signed up. Signing tenancies for the rest would take longer, which was not unusual at this time, he added. In a joint venture with the Al Rajhi banking group, 80% of i-City’s phase one was sold to the Middle Eastern group for RM95mil in July last year. Eu Hong Chew, a non-executive director, said i-City was developed to cater to the knowledge economy and was positioned to uniquely serve such companies with multi-telco and high-speed Internet facilities. I-BERHAD, developer of the i-City project in Shah Alam, may work with companies under the Permodalan Nasional Bhd (PNB) stable to enhance its development, its chairman said. Chairman Tan Sri Hamad Kama Piah Che Othman, who is also the president and chief executive officer of state-owned investment fund PNB, said I-Berhad wants to rope in more partners in the information technology area and may work with other PNB-owned companies. "PNB is in many sectors. Some of those in the technology and property area can work with I-Berhad if there is good synergy. 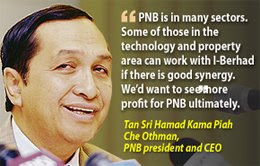 We'd want to see more profit for PNB ultimately," Hamad Kama Piah said in a press conference after I-Berhad's shareholder meeting in Shah Alam yesterday. PNB holds 18.5 per cent of I-Berhad. I-Berhad started as a digital lifestyle products maker, but had three years ago launched i-City as part of plans to re-invent itself into a property developer that provides a digital working environment. The RM2 billion commercial township has already forged strategic alliances with global leaders in the digital industry, such as Intel and Cisco, and has secured investments from ServCorp of Australia and Al-Rajhi Banking Group of Saudi Arabia. The company made a record pre-tax profit of RM16 million last year and has over RM120 million in cash with zero borrowings. Its net tangible assets have increased to RM1.54 per share, chief executive officer Lim Boon Siong said, and there is still a substantial part of i-City to be developed. Only a tenth of the available land has been developed and the first phase, which was launched three to four months ago, has seen good tenant response, Lim said. The value of the remaining 90 per cent of land at i-City has tripled in value compared to its original cost, Lim said. The development relies on high technology to help tenants save operation costs, while the syariah-compliant office suite in the first phase helps draw Islamic finance investors. The two selling points will help the project in an economic downturn, he said, as more cost-conscious companies would prefer i-City while the Islamic finance players are more resilient in this crisis. Sime Darby Property (SDP), the property arm of Sime Darby Bhd, made sales of RM86 million in just the first four days of its third "Parade of Homes" marketing campaign. The company started the campaign in June 2008. Malaysia's property market faces soft demand amid an economic slowdown and developers are giving incentives like lower downpayments to pull buyers. SDP's offers proved to be attractive as almost 1,000 people visited its booth at a property exhibition and its 10 sales galleries, it said in a statement. Among others, SDP offers a lower interest rate on the loan and buyers can pay the downpayment in 12 instalments. The third campaign started on March 6 and will end on June 15. "Evidently, our continuous research has given us an insight into property buyers' needs and concerns. These findings have allowed us the ability to offer property buyers unique packages during our Parade of Homes campaign," managing director of SDP Datuk Tunku Putra Badlishah said in the statement. SDP's first Parade of Homes campaign attracted more than 15,000 visitors and generated sales worth more than RM246 million over nine days. The second campaign in November 2008 made over RM146 million in sales. Results of the first two campaigns have also helped SDP to post a 7 per cent increase in revenue to RM566 million in the first half to December 31, 2009. The 32 high-end apartment units in Casa del Rio Melaka, located along the Malacca river, may be sold for an estimated RM20 million collectively. These apartments form part of the RM102 million Casa del Rio Melaka boutique hotel, mall and apartment project which will open in June 2010. "The apartment units will measure between 1,134 sq ft and 2,109 sq," Tan Sri Syed Yusof Syed Nasir, group managing director of Casa del Rio (Malaysia) Sdn Bhd, the project developer told Business Times in an interview. Set to be launched within the next two months, these two-bedroom and three-bedroom units are said to have received encouraging response. Once they are sold, the buyer has the option of appointing Casa del Rio to manage for them. The four-storey building will also have 64-bedroom suites that will all sit on 1.29ha along the Malacca River. 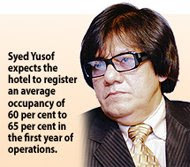 Meanwhile, Syed Yusof expects the hotel to register an average occupancy of 60 per cent to 65 per cent in the first year of operations. This could rise to 70 per cent in the second year. "We expect a positive cash flow. We are looking at about RM450 per night to RM1,000 per night for the larger suites," added. Casa del Rio is Spanish for "Home by the River". The hotel has Spanish influences, but also retains the local character in keeping with Malacca as World Heritage site. Syed Yusof also operates the 570-room Concorde Hotel Kuala Lumpur, the 381-room Concorde Shah Alam and the 338-room Concorde Inn KLIA. IOI Corp Bhd will not offer more than RM2.598 per share and will proceed with taking IOI Properties Bhd private. In response to a news report of IOI Prop minority shareholders holding out for better offer, IOI Corp said in the light of the current global economic downturn, the offer is fair and reasonable. "The offer price of RM2.598 represents a 20 per cent premium over the five-day weighted average price of IOI Prop up to January 30 2009 of RM2.16," it told the stock exchange yesterday. Based on the annualised first half earnings of IOI Prop's current financial year of 22 sen a share, the offer price of RM2.598 translates to a price-earnings ratio of 11.8 times, comparable to peers listed on Bursa Malaysia. In August 2008, IOI Prop completed a rights issue to raise funds for its land development in Sentosa Cove, Singapore. Close to 94 per cent of the total rights issue offered to all shareholders was subscribed by IOI Corp at RM4.85 per share, which contributed to an increase in IOI Prop's net tangible asset. IOI Prop's obligations to its Singapore joint ventures in Sentosa Cove amounts to S$1.5 billion (RM3.6 billion). In privatising IOI Prop, IOI Corp's cash outlay is RM64.3 million. If IOI Corp's RM2.598 offer is completely in cash, the outlay would balloon to RM506 million. Given the current economic conditions and the need to conserve cash, IOI Corp cannot justify such a large cash outlay. In the recent rights issue of IOI Prop, IOI Corp had already committed RM737 million in cash outlay. There is high liquidity in IOI Corp's shares. It is easy for minority shareholders to convert their IOI Corp shares to cash, if they wish to. AmInvestment Bank said to date the level of acceptance from IOI Prop's minority shareholders, including retail shareholders, had been strong.